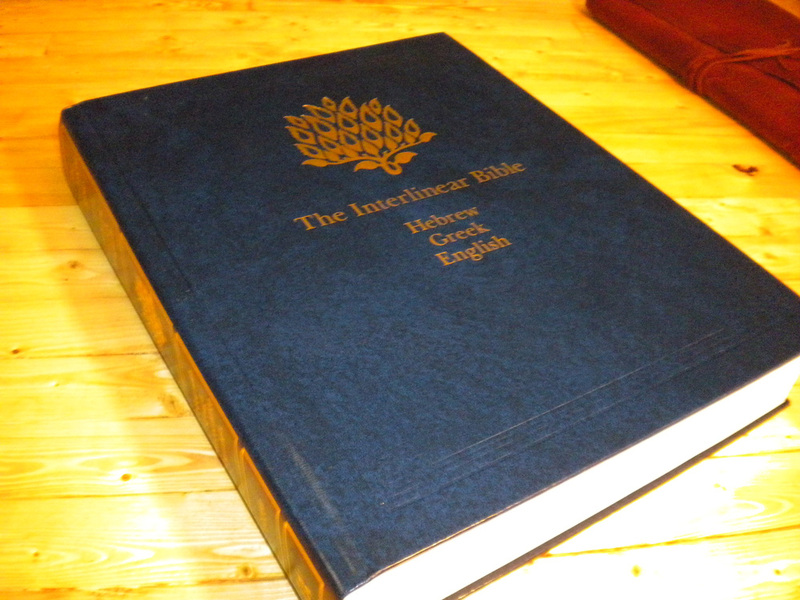 There are quite a few reviews out there on Hendrickson’s Hebrew-Greek-English Interlinear Bible that are commenting negatively on the size of the print within this book. While these negative comments are hard to argue with, the resource value of this book really is fantastic. If you don’t have the best eyes, then you will want to get a magnifier of some sort. Some of the smaller markings on the original text are pretty hard to read unfortunately. Alternatively, Hendrickson has a 4-volume set that they have created that should have a more user-friendly font. Even so, this single volume one is a fantastic resource. If you are wanting to get a resource that you can see the literal translation into English from the Hebrew and Greek, then this is a fantastic option for you. The English portion of the New Testament is one of the most literal translations – it is not King James version, but it is derived from the same Textus Receptus that the King James was translated from. Likewise, the Old Testament is a literal translation from the Masoretic Text. The English reading may be a tad odd for some readers as it is a literal translation which doesn’t always make for a smooth flowing reading experience. Especially in the Old Testament where they kept the inline English reading with the Hebrew, so it reads right-to-left. Even with that, this is a resource to help you study the Word and get a better understanding of the original languages in which it was written. Included in the text are also the Strong’s reference numbers. I received a copy of this Bible in exchange for this review from Hendrickson Publishers and all opinions are my own. General Editor and Translator: Jay P. Green, Sr.
Price: At the time of writing this review, the cheapest place to get this book is at Christianbook.com. They have it for $29.99 – suggested retail from the publisher is $69.95. Please note that these prices do not include any potential shipping charges. If you would like to purchase this book, please support my blog and purchase by clicking any of the links to Christianbook.com on this page like the one below. By Jay P. Green / Hendrickson PublishersKeyed to Strong’s Exhaustive Concordance and the only complete interlinear Bible available in English, this one-volume Interlinear Bible offers pastors, students, and laypeople a time-saving tool for researching the subtle nuances and layers of meaning within the original biblical languages. Featuring the complete Hebrew and Greek texts with a direct English rendering below each word, it also it also includes The Literal Translation of the Bible in the outside column. Strong’s numbers are printed directly above the Hebrew and Greek words which enables those with no prior knowledge of Greek or Hebrew to easily access a wealth of language reference works keyed to Strong’s Greek/Hebrew dictionaries, analytical lexicons, concordances, word studies and more.The Hebrew is based on the Masoretic Text and the Greek is from the Textus Receptus. The sources of the texts are documented in the preface, and are essentially the same (with some minor variations) to the Hebrew and Greek texts used by the KJV translators.This one-volume Interlinear Bible contains 4-point text. The typical presentation page that contains the Presented To, By, Date and Occasion for you to write in. 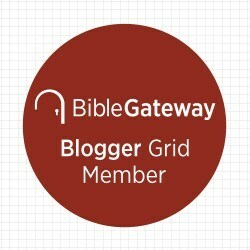 I would highly recommend you check out this section as it gives a great overview of what text origins are used within this Bible and how the English translation portion was derived. The Scripture pages for the Old and New Testaments are basically the same. Divided into two vertical column segments. Each segment has the left side of the column as the English Literal Translation in a normal reading format. The right side of the column has the original language, Strong’s numbers and the literal translation words directly below their original language counterpart. 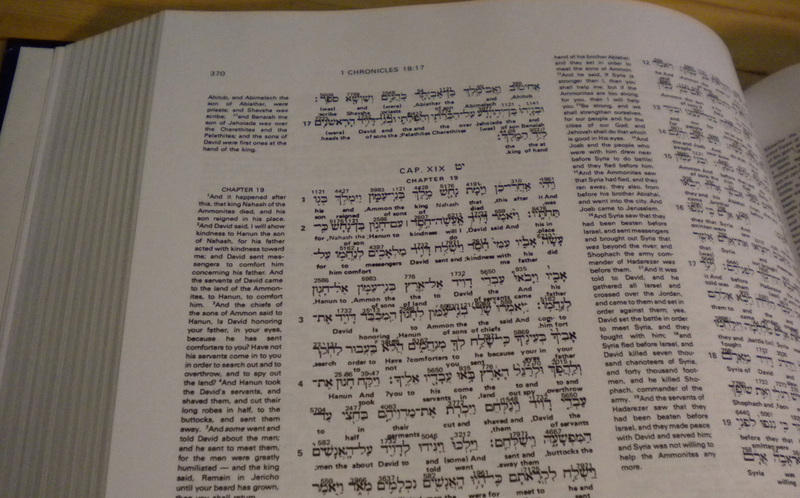 The thing to keep in mind is that Hebrew (in the Old Testament) reads right to left, so using the original language section, you will have to mentally adjust a little bit, but that actually came fairly quick and easy for me, so I’m sure you will be fine. Showing how the English text reads with the Hebrew from right to left. Showing how the English text reads with the Greek from left to right as most people are used to. As I mentioned in my summary, the font size used for this book is small. You can see in the pictures below showing the comparison of the font to the size of an US Quarter. 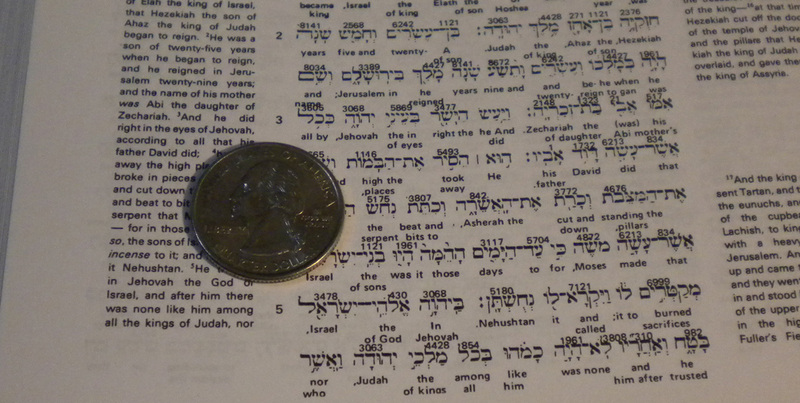 Showing the Hebrew in the Old Testament with an US Quarter for font size comparison. 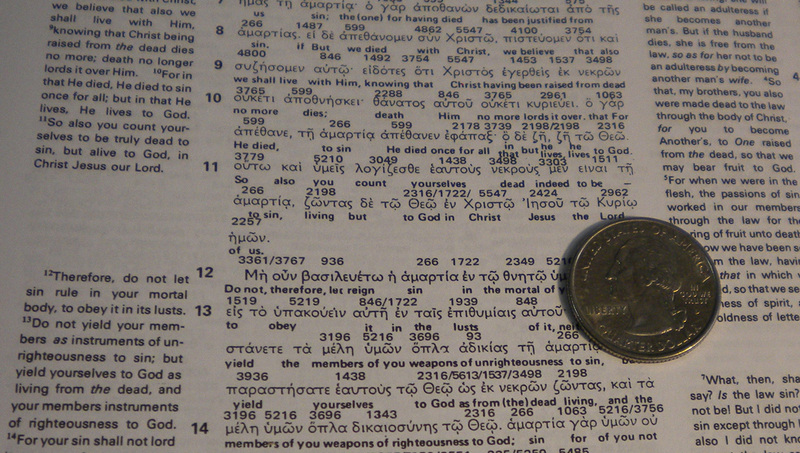 Showing the Greek in the New Testament with an US Quarter for font size comparison. The English portion of the New Testament is one of the most literal translations – it is not King James version, but it is derived from the same Textus Receptus that the King James was translated from. Likewise, the Old Testament is a literal translation from the Masoretic Text and is designed to be as literal as possible. This section provides comparisons of the Greek where the different New Testament manuscripts differ some. This section contains a list of the times when Jesus quoted directly or indirectly Scriptures from the Old Testament. Smyth Sewn which really helps to have a more durable Study Bible. The paper used is very opaque making show through very unnoticeable. 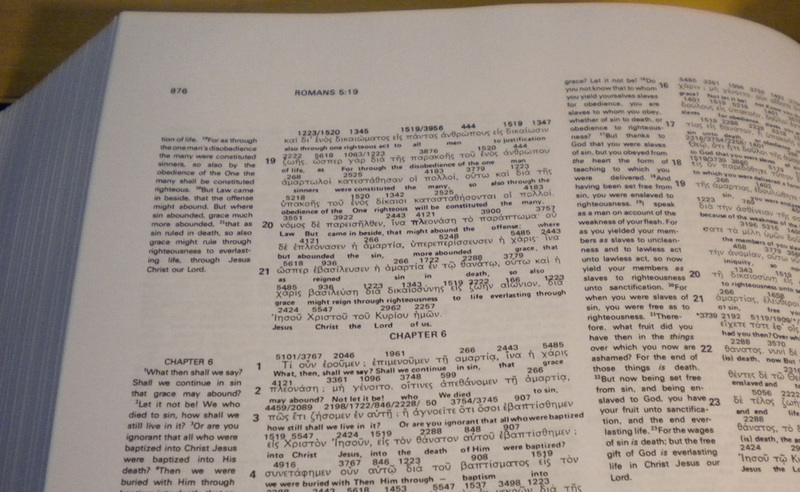 Quality: 9.1– This Bible is a hardcover Bible, but it feels very well made. The Smyth sewing helps to ensure it will be a long-lasting resource. Appearance: 7.9 – The appearance of this Bible is nice, but I do have to lower the rating a little bit for the font size issue I previously mentioned. Value: 8.9 – For the price, you really do get an excellent resource to say the least. 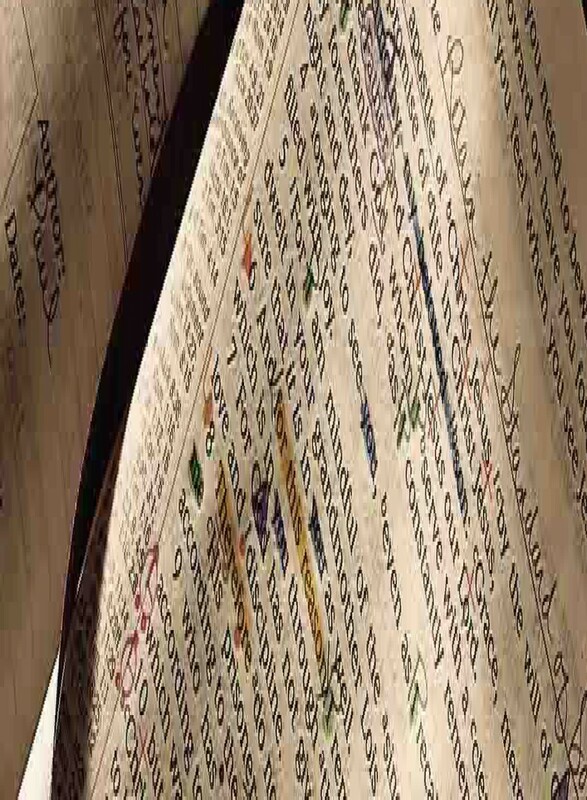 If you want a larger font, then you may want to consider the 4-volume set instead (9781565639805). Innovation: 8.9 – Just the idea of having the original languages with a literal translation next proves to be a very valuable study tool. Other/Wildcard: n/a – No real wildcards to speak of to adjust the rating points for this Bible. From the publisher’s website: Hendrickson Publishers has a strong history of producing outstanding academic, trade, and reference books at a reasonable price. 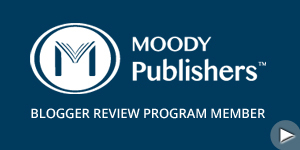 Through our academic publishing program, we seek to meet the publication needs of the religious studies academic community worldwide with works on the Hebrew Bible and Hebrew language, ancient Near Eastern studies and archaeology, New Testament and Greek language, biblical theology, Judaism, patristics, church history, historical theology, practical theology, and religion and culture. Hendrickson is also delighted to be partnering with the German Bible Society, the premier publisher of original language Bibles. On the trade end, Hendrickson is pleased to offer a greatly expanded Bibles publishing program, including a wide variety of print, audio and DVD Bibles. Our products include books on Christian living topics, Biblical studies and reference works for both pastors and the thoughtful layperson, devotionals, and many of the Christian classics. Hendrickson Publishers is committed to excellent customer service, with next-day service available, and hassle-free returns. This entry was posted in Bible, Bible Reading, Bible Reviews, Bible Studies, Bible Study, Bible Study Resources, Biblical Meditation, Exegesis, Greek, Hardcover, Hebrew, Hendrickson Publishers, Hermeneutics, Jay P. Green, Reference Bible, Reference Book Reviews, Reference Books, Rose Publishing, Rose Publishing, Scriptures, Spiritual Life, Sr, Word of God, Word Studies and tagged Bible, English, Greek, Hebrew, Hendrickson Publishers, Interlinear, Jay P. Green, Jay P. Green Sr., Sr. Bookmark the permalink.